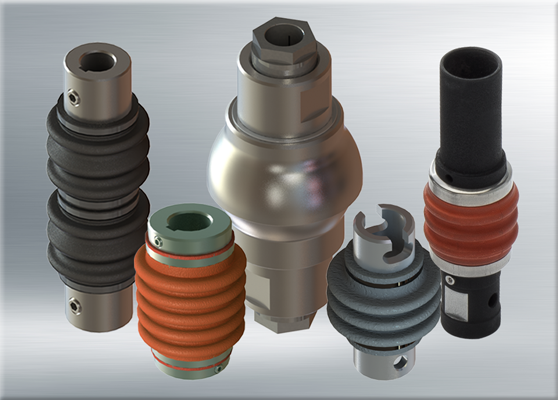 Lubricant-retaining boot covers (bellows) play an important role in protecting the universal joint. Proper lubrication reduces friction, wear and heat generation and can significantly prolong the useful life of the assembly. Boot covers can also prevent contaminants, such as chips, dirt, acids and/or other abrasives, from entering and damaging the joints. Since boots retain the lubricants, they can also prevent contamination of the environment by keeping the lubricant contained in the boot. Standard boots are typically manufactured from Nitrile. However, special operating environments might require other boot materials and lubricants. For instance, if the universal joint operates in a vacuum environment, boots might collapse or the lubricant might gas out. In such and similar instances, metal boots may offer the ideal alternative solution. They also deliver increased resiliance over silicone boots during chemical wash-downs.